If you’re organizing your stag or hen in Cork, then why not organise the perfect hangover cure! In our beginners lesson we start you off easy with the basics and give you a foundation to build on, with a relaxed step-by-step method to break down the seemingly impossible task of leaping to your feet and riding along a wave. The surfboards we use for beginners lessons are long foamboards. 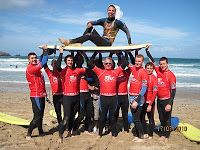 The lenght and buoyancy of the boards give you the best possible chance to develop your surfing skills. We supply your boards and wetsuits. 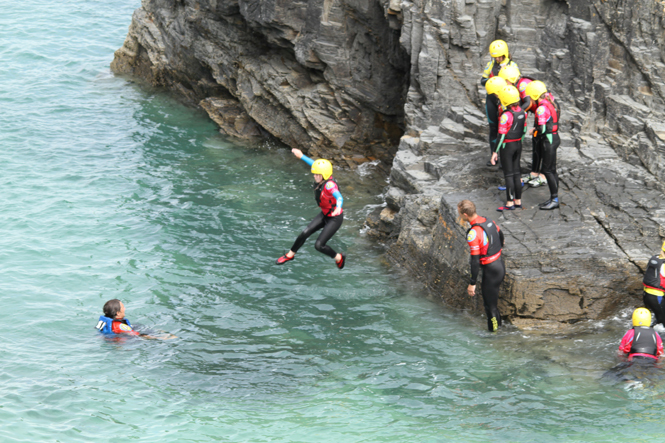 Coasteering is an action packed, adrenaline pumping adventure activity that takes place around the rocky coastline. It is a combination of adventure swimming, exploring gullies and caves using the movement of the swell and traversing the lower level rocks to jumping sites. Jumps range from 1 – 5 meters in height. We will supply you with wetsuit, bouyancy aid and helmet, you just need to bring footwear, ie. runners. An activity day at Inch Beach. We will supply you with all the equipment, you just need to bring footwear, ie. runners. The schedule depends on your own requirements but we recommend a 11am start and your finished by 3.30/4pm. Contact us to tailor make your hen/stag party. Swell can organise a bus to come collect you guys or girls, take you out to us in Inch, we’ll get you in the water to catch a few waves and clear those heads. Then the bus will drop you back to Cork afterwards, maybe stopping off for a well deserved pint on the way back!